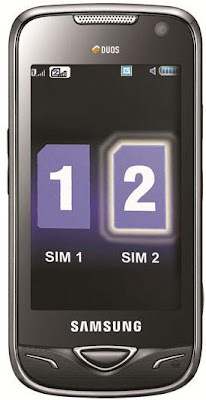 Samsung has announced its latest Duos series mobile phone, Samsung Star Duos B7722 mobile handset, it's first dual SIM 3.5G + 2.5G dual standby capable handset loaded with 3.2 inch WQVGA touchscreen display along with weight of around 112 grams makes it easy to pocket, hold and carry. Samsung Star Duos B7722 allows to play audio and video with its built in FM radio, the device is loaded with 5 mega pixel digital camera that captures the stills in the resolution of around 2592X1944 pixels. Samsung Star Duos B7722 will have 200MB memory which offers to store unlimited number of phonebook contacts and messages, the memory of the device can be expandable up to 8 GB via microSD card. 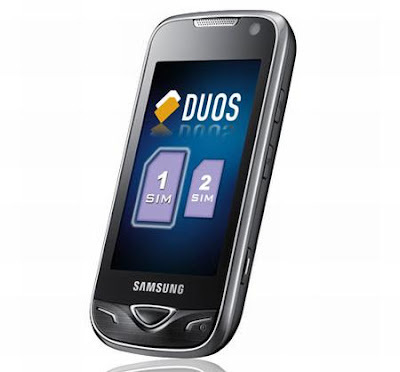 Samsung Star Duos B7722 has excellent battery back up as it will loaded with standard Lithium-Ion 1200 mAh battery which offers the maximum talk time of 12 hours and maximum standby time of 450 hours. This upcoming mobile has the option of high speed emailing, instant messaging, messenger chat along with multi-media messaging features. Samsung Star Duos B7722 will support to both 2G/GSM and 3G/HSPDA network, its 2G network will be running on the band with ranges 850,900,1800 and 1900 MHz, while its 3G/HSPDA network will be working on 900 and 2100 MHz. Samsung Star Duos B7722 will give great facility of browsing, downloading and uploading speed likes of a broadband connection. The device has Wi-Fi connectivity, full HTML browser, it supports to social networking sites as well as advanced bluetooth and USB for data transferring. With all the best pros like 3G network support, Wi-Fi connectivity, 5 mega pixel camera, excellent battery back-up, high touch responsive touch screen, direct access to social networking sites the devices has high quality of games.